Poor quality scan of photograph of John Skinner, Embo, and his wife Johan (nee Bruce) with their daughter Bella. 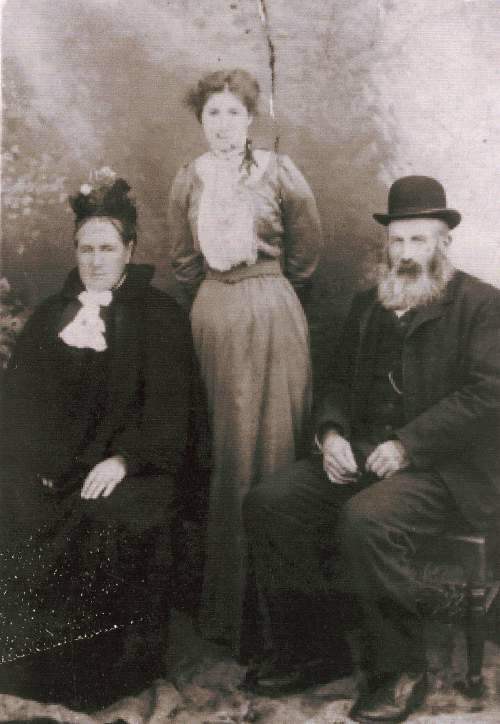 Johan Bruce (1841-1904) and John Skinner (1836-1910) were my great-great-grandparents. Johan was born in Rogart and was a Gaelic speaker. She moved with her family to Culmaily in the 1850s and married Aberdeenshire ploughman, John Skinner, in the Free Church at nearby Golspie in 1861. Judging by the diverse birth places of their 13 children, the couple moved frequently within Sutherland and Easter Ross during the first 25 years of their marriage as John found work as a farm grieve. They eventually settled in the Dornoch area and ran a grocer’s shop in Embo from the late 1880s. Jessie (1876-1954), wife of John McGregor Fraser (1873-1938). In this photograph, Bella is presumably Isabella Gordon Skinner (1879-1934), the ninth child and the youngest of the four daughters. Given Bella’s date of birth, the shot must date from the 1890s. Many thanks for your comment and additional information - I will change the date of the photograph to 1890 - Administrator.